Narendra Modi’s banknote recall is becoming a make-or-break moment. India’s prime minister is under fire after a move to cancel large-denomination rupee notes amounting to 86 percent of the total outstanding by value. 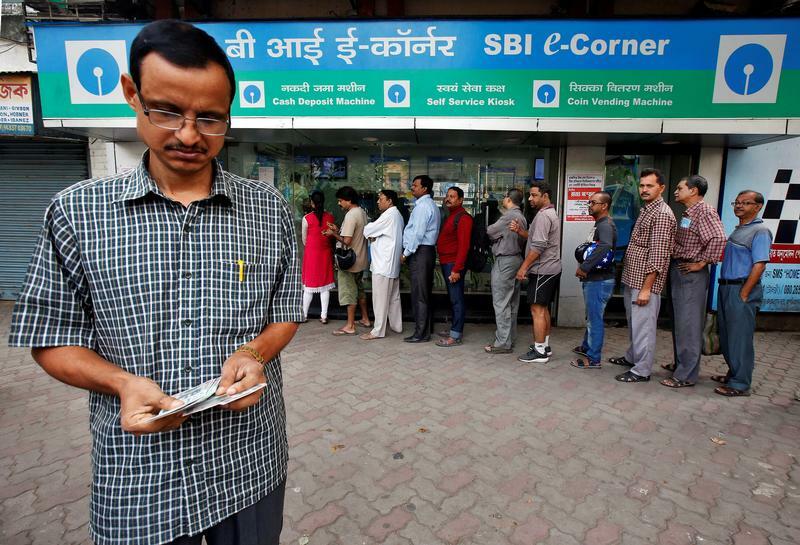 The bold step to fight corruption has left Indians queuing outside bank branches since Wednesday to swap old notes for legal tender, bringing parts of the nation’s economy to a standstill. The pain is most palpable for the informal sector, which accounts for almost half of GDP and the vast majority of employment. Tendering old notes above a minimal value for new ones requires a bank account, but 40 percent of the population is outside of the formal banking system. No wonder tensions are running high. If Modi can ride out the immediate backlash, though, demonetisation could potentially provide a big fiscal boost. Suppose that holders of one-fifth of the notes in circulation will not try to exchange them out of fear of attracting scrutiny from tax authorities. That means currency worth almost $50 billion, or 2 percent of GDP, could suddenly become worthless. In theory that would sharply reduce the monetary liabilities of the Reserve Bank of India, and brokerage Edelweiss reckons that in turn could allow the central bank to pay a higher dividend to the government. Other economists suggest this may not be legally possible, but the RBI does face pressure each year to boost its payouts to New Delhi. A windfall could help India boost spending while meeting its ambitious plan to narrow the fiscal deficit to 3 percent of GDP by March 2018. It would give Modi the funds for big-ticket items such as a recapitalization of the nation’s ailing state-backed lenders, which could require more than $30 billion. The twin effects of a slowdown in economic activity and the reduction in money supply should also bring down inflation, making room for more interest rate cuts, which could boost growth in the medium term. The recall is certainly working: Banks have already collected a staggering $44 billion of deposits in barely five days. Modi clearly hopes that it will do the economy more good than harm once the initial shock of last week’s move wears off. Either way, it could prove central to his legacy. Indian Prime Minister Narendra Modi on Nov. 13 defended a move to abolish large denomination banknotes in an effort to curb corruption. "I know the forces up against me, they may not let me live, they may ruin me because their loot of 70 years is in trouble, but I am prepared," he said in a speech at the western seaside resort of Goa. The decision to demonetize high value notes was planned in secrecy over the past 10 months, he said. Indian banks have received 3 trillion rupees ($44 billion) of old 500 rupee and 1,000 rupee notes since the country rendered the denominations illegal from Nov. 9. 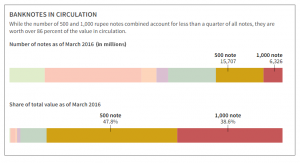 The move invalidates some 86 percent of India's banknotes by value, worth almost $250 billion. In response to growing public frustration with difficulties in accessing new notes, the finance ministry said that it had relaxed cash withdrawal limits including removing a per-day cap of 10,000 rupees and increasing the weekly limit to 24,000 rupees from 20,000. The Reserve Bank of India said on Nov. 13 that people "need not be anxious" and "need not come over to banks repeatedly to draw and hoard".